Have a look at the engraving of the canary at the head of this article. If you have read History, part 6, it may look familiar. It is a copy of the engraving published in Olina’s Uccelliera (1622), but it is not Italian. It was a product of international collaboration; an example of globalisation over 350 years ago. It appears in Historiæ Naturalis de Avibus written by Joannes Jonstonus; engraved by Matthaeus Merian, and published in Amsterdam in 1657. Jonstonus was born in Poland but has a British connection: he was descended from Scottish nobility (the son of Simon Johnston), and was awarded degrees in Cambridge and Leiden (Holland). The pan-European origins of the book don’t stop there: Merian was a Swiss working in Germany. Twenty years later, it was copied again, this time by the John Martin (!) the London engraver for Ray and Willughby’s Ornithologia (1676). The international theme continues because John Ray and his patron Francis Willughby (1) had toured the Netherlands, Germany, Switzerland, Austria, Spain, France and Italy (2) between 1663 and 1666 to find specimens. Ornithologia is famous not only for its extensive illustrations, but also for being the first serious attempt at classification of birds according to their characteristics. Most academics give Ray the credit for this, but Ray’s special interest was plants, and it was Willughby that wrote most of the descriptions of birds, animals and fishes. Willughby died of pleurisy in 1692 but his Ornithologia, written in Latin, was completed by Ray and published in 1676. In response to popular demand, an English version,The ornithology of Francis Willughby, was published in 1678. It was not unusual for scholars to travel widely if they enjoyed aristocratic patronage, or to escape religious persecution (both applied in Ray’s case). They also corresponded with each other, aided by a common language, Latin. Therein lay a problem: they were an academic elite; their studies of birds over-reliant on bird skins in museums or ancient tomes in libraries rather than studying birds in the field (3). 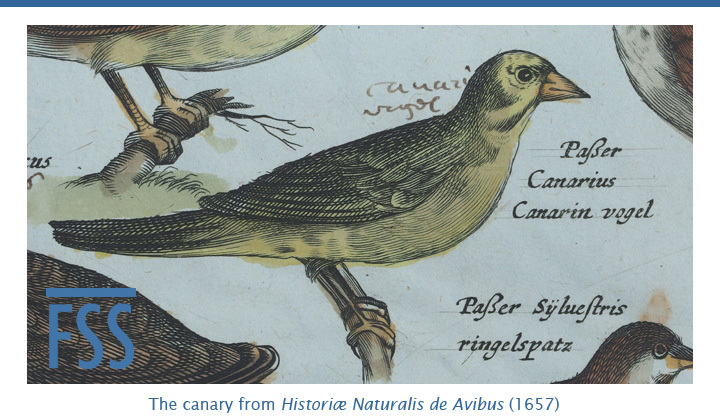 Descriptions of the canary were still based on Gesner’s account a century after his De Avium Natura. Had they paid more attention to the birds themselves, they might have discovered that the Germans were well on the way to producing a clear yellow canary. Thanks to the research undertaken by Kinzelbach and Ragnar, and brought to our attention by Tim Birkhead, we know that canary mutations had appeared in Germany around 1580. Marcus Zum Lamm, a Protestant cleric working at the Royal Palace in Heidelberg, produced coloured paintings of four canaries, two of which were variegated and one of these has a nascent crest. Meanwhile, in England, there was progress too. Not in the development of canaries, but in the world of publishing. It started with The Epitome of the Art of Husbandry by J.B. Gent. The author was not a Mr. Gent as some have assumed, but Joseph Blagrave, gentleman. Blagrave was born in Reading and studied astrology and physics. We don’t know what persuaded him to write on husbandry, but his first book was published in 1658, followed by the Epitome in 1669. It was full of practical advice for farmers and land owners, and must have been a success because he brought out a second edition in 1675. This is the book that interests us because it contained ‘Some Further Additions Concerning Singing-Birds’, neatly divided into softbills and hardbills. The additions were extensive, some 136 pages, so he must have felt there was a demand. Most of the information on the canary was based on German practice. Blagrave introduces the canary by telling us that “This Bird we had formerly brought over from the Canaries and nowhere else, and so is generally known by that name; but of late years we have an abundance of their kind come out of Germany, so we call them by the name of the Country, German-Birds’ (6). He adds that the ‘Birds brought from the Canaries are not so esteemed as formerly, for the Birds brought out of Germany far exceed them for handsomeness and Songs; the German-Birds having many fine Jerks and Notes of the Nightingale’. When it comes to breeding, he assures us that ‘I shall shew you every thing exactly as they breed them in Germany, according to the best information I have received of those that have seen them and bred them also’. The Epitome was the first practical guide to canary keeping and Blagrave’s text was widely plagiarised by others, notably Ray in his Ornithology, but also in more modest publications by Blome and Cox in the seventeenth century, and by almost every author in the eighteenth. Perhaps it worked too well, because the enterprising Germans turned canary breeding into an international trade. In the seventeenth century, Nuremberg alone was producing 8,000 birds annually (8). By 1892 some 100,000 canaries were exported each year for the American market, and 50,000 for the British (9). Breeding birds was no longer a hobby; it was an industry. Having created the first distinctive mutations of the canary, the Germans played little part in their development. For the next advance in canary culture we have to return to France at the dawn of the eighteenth century. The Willughby family had two family seats, Middleton Hall in Warwickshire and Wollaton Hall in Nottingham. Bird Etchings, Christine Jackson (1985) p.51. Tim Birkhead gives an account of the battle between the systematists and the field ornothologists in The Wisdom of Birds (2008), p.49. Marcus Zum Lamm: Die Vogelbücher Aus Dem Thesaurus Picturarum, Kinzelbach, Ragnar K., 2000. A review of this book will follow. Birkhead (2003) p.101. Tim Birkhead dismisses claims by Hernandez that all yellow canaries had been established a century earlier, on the grounds of mistaken identity. He suggests that the earliest evidence of a possible yellow canary is a painting by Johann Walter in 1657. However the bird, described as Passer flavus ex Illyrio missus (golden sparrow sent from Illyria), has light brown wings and is probably the Golden Song Sparrow (Passer luteus) or the Arabian Golden Sparrow (Passer euchlorus). The Epitome of the Art of Husbandry by J.B. Gent, second edition 1675, p. 107 of the New Additions. From e-rara-ch. Experiments and Observations on the Singing of Birds, Daines Barrington, 1773, p261. Comment by Kinzelbach, Ragnar K., 2000, p314. Money in raising canaries, Los Angeles Herald, Vol 39, No 40, 20 November 1892. (From the California Digital Newspaper Collection). Canary Birds: How to Breed for Pleasure and Profit, Dr. Karl Russ, 1891, p.21. (From the Biodiversity Heritage Library).